The deputy chief financial officer (CFO) of the Sarasota County Schools told the School Board this week that he anticipates the district’s 2016-17 fiscal year budget to be about $2.7 million in the black, given the preliminary per-student funding proposals of the Florida House and Senate, as well as anticipation that Sarasota County property values will increase by 7.73 percent this year. However, School Board member Frank Kovach pointed out that the estimate does not include any raises for next year as a result of negotiations with the Sarasota Classified/Teachers Association (SC/TA). Therefore, the budget potentially could include two sets of raises, which would have an impact on the district’s unrestricted fund balance. “That’s why I keep prefacing that these numbers will change,” Deputy CFO Al Weidner told Kovach. 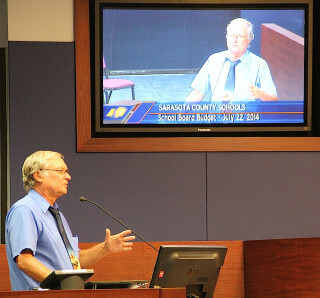 The discussion was part of the School Board’s Feb. 16 workshop in Sarasota. 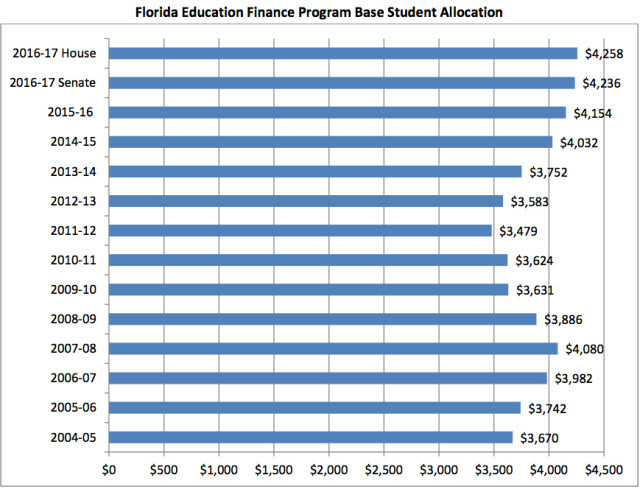 Figures Weidner presented to the board showed that, using the Florida House’s proposed per-student allocation for the next school year — which is slightly lower than the Senate’s — the district would have an unrestricted fund balance at the end of 2016-17 of $34,667,657, or 8.21 percent. 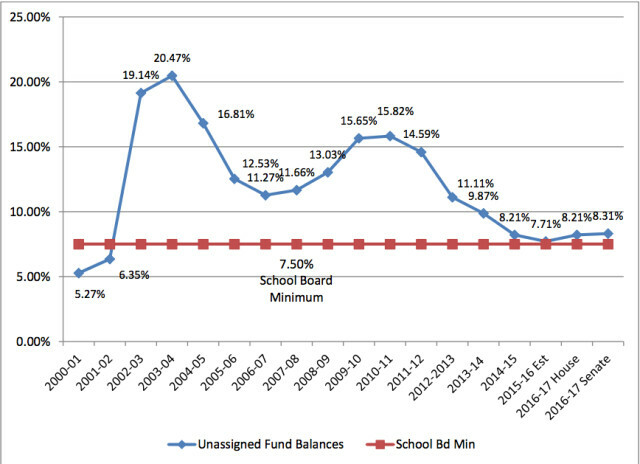 Mitsi Corcoran, the district’s chief financial officer, has pointed out to The Sarasota News Leader that School Board policy 7.101 provides for a minimum unassigned fund balance of 7.5 percent of the projected general fund revenues during a fiscal year. The state required minimum of 3 percent is set out in Florida Statute 1011.051. In past years, Weidner told the School Board this week, “It was cut, cut, cut, cut,” especially during the recession. “We are at the bone. I just don’t know what we would reduce” if a budget surplus was not in the forecast. Department budgets have been frozen for about three years, he noted. 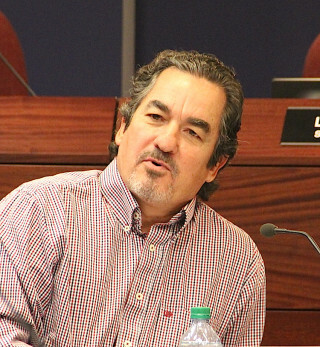 One primary reason for the health of the district’s budget projections, Weidner continued, is the revenue from the extra 1-mill levy Sarasota County voters have approved four times since 2002. The last referendum was held in March 2014. This year, Weidner said, that tax is expected to bring in $48 million; for the next fiscal year — based on the county’s projected property value increase — the total would be about $52 million. When Kovach asked what was the largest amount of revenue the tax ever brought into the district, “going back to the crazy times,” Weidner replied that it was about $60 million. Kovach was referring to the economic boom before the Great Recession hit. That means the county’s property values are approaching the level they hit before the downturn, Kovach said. “They’re starting to climb back towards that,” Weidner responded. In explaining his projections, Weidner pointed out that the Florida House is calling for an increase of 1.75 percent in student funding for the next fiscal year, while the Florida Senate’s proposal is for a 2-percent raise. The Legislature is scheduled to adjourn on March 11, he said, and it appears the state budget will be finalized beforehand — unlike the situation in 2015, when disputes between the House and Senate ultimately necessitated a special session to approve the budget. In regard to expenditures for 2016-17: Altogether, Weidner said, he anticipates an increase of $8,130, 624. The majority of that is linked to the need for extra staff, based on the projected enrollment rise of 530 students. A timeline he provided the board shows that if the Legislature does finalize its budget before adjourning next month, district staffing levels for the 2016-17 year could be released to the principals on March 22, following a School Board workshop that will encompass a review of the state funding decision and its estimated impact on the district’s spending plan. “We do know we’re going to be needing to hire quite a few teachers,” Weidner pointed out. That is not just a factor of the projected increase in enrollment, he said. The district will be losing 44 teachers to retirement at the end of this year, he said. Additionally, a number of vacancies remain unfilled, Weidner told the board. In response to a News Leader request for information, district Communications Specialist Scott Ferguson reported that, at present, the district has 2,344 instructional employees, most of whom are classroom teachers. He added that the district has 19 vacancies. Among the personnel being sought are five speech and language pathologists, six elementary school instructors and two middle school science teachers. In discussing other facets of the budget, board member Jane Goodwin asked about Weidner’s estimated 10-percent increase in the cost of health benefits for the next fiscal year. The district’s risk manager said the trend appears to be about 7 percent, Weidner replied. “I try to make sure that my budget is a worst-case scenario,” he added. On the positive side, he noted, Florida Power & Light representatives have told him they anticipate a decrease in the company’s rates for next year. Superintendent Lori White will present her tentative 2016-17 budget during a meeting scheduled for 4 p.m. on July 19. The required public hearing to adopt the tentative budget and millage rates for 2016-17 is set for 5:15 p.m. on July 26. The final public hearing on the budget and millage rates is scheduled for 5:15 p.m. on Sept. 13. During brief remarks before Weidner made his presentation this week, Corcoran, the district’s chief financial officer, reported learning through a conference call last week with the district’s financial advisers that it might be possible to refinance debt the School Board incurred for past construction projects. That was surprising news, she noted, given the global volatility in financial markets. 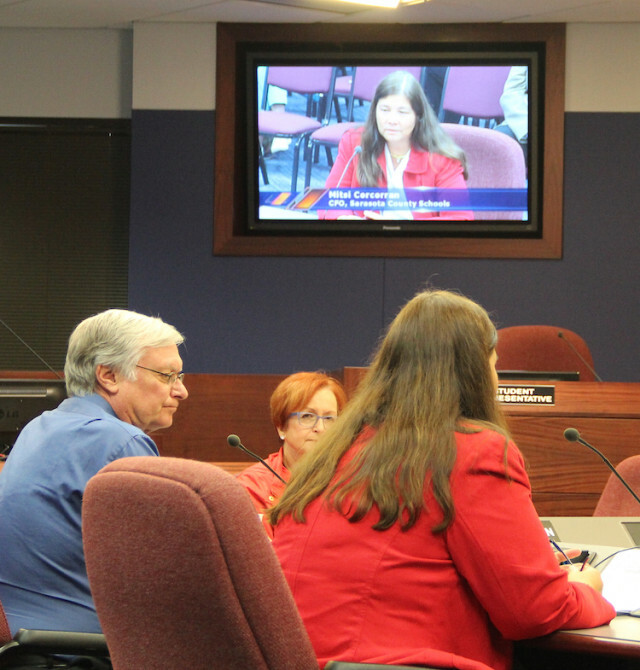 Corcoran added that she would return to the School Board with the results of the RFP process.